Even though I sell my own artwork online, I find it so incredible a very flat, digital image can be imagined as something that can one day hang on your walls in all three dimensions. The goal that I am always working towards is enabling someone who is looking at my work on a screen to envision it in a setup as close to real life as possible. Sometimes that is easy, other times it is more difficult. Envisioning the scale of the brush strokes and the size of canvas can be daunting to prove. The added challenge of accurately representing color is a whole other beast. I have been so fortunate to work with shop owners, gallerists, and kind individuals that have welcomed me and my art into their spaces and homes to present my work in person. As beautiful as a painting can be styled up, there is truly nothing quite like seeing art in person. You can see the history of the painting in the brush strokes and the layering, and you have the opportunity to feel the spirit of the painting even more. Have you ever seen my work in person? If you haven't, there are a couple of ways you can! The Collective - Shop Small Fort Worth: The Collective is an amazing collection of a range of items from gift items, to clothes, to jewelry, to home goods made by makers and creatives that live and work in Fort Worth! It is such a cute, bright and fun space, and my art is now hanging on their walls and is available for purchase! I have a handful of oil pantings up right now, but am looking to add a couple of other items very very soon! 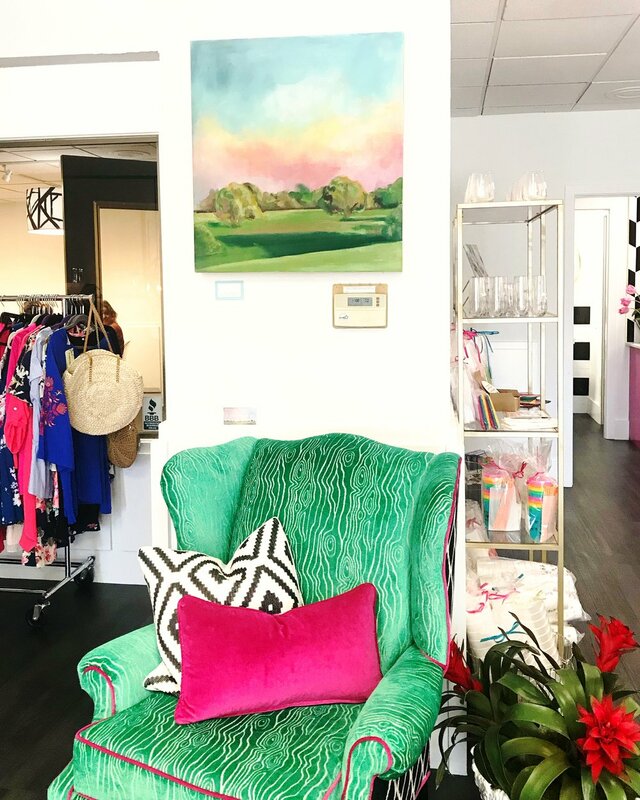 Renovate - Located in my hometown of Houston, TX, Renovate is a wonderfully curated home good and gift store. Several of my paintings available exclusively through their shop. I am so fortunate to have my art in such a beautiful and well-decorated space! Bee Street Studio - This place is an interior designer's art HEAVEN! Some of the tallest walls I've seen are covered top to bottom with beautiful painting upon beautiful painting. Taken as a whole scene, it is incredible. But even as you look closer at each painting that hangs on their walls, the level of awe only increases. I am so fortunate to be a part of such a wonderful and encouraging art warehouse! Bee Street is located in Dallas, but just announced they are opening up a Fort Worth location very soon! In-Home Pop Up Shop - These are my absolute favorite events to be a part of. These types of events are a gathering of a range of small businesses without a store front that get together for a couple of hours in someone's home. The host invites all of her friends, and the featured businesses invite all of theirs! It is such a wonderful way to get to know new people in the area, and learn about all of the fun things other small businesses are up to. I am going to be a part of one on October 9th, and I'm so looking forward to meeting all kinds of new people! Would you be interested in hosting one at your home? I would be honored to be a guest! Let me know if you'd like to set a date!